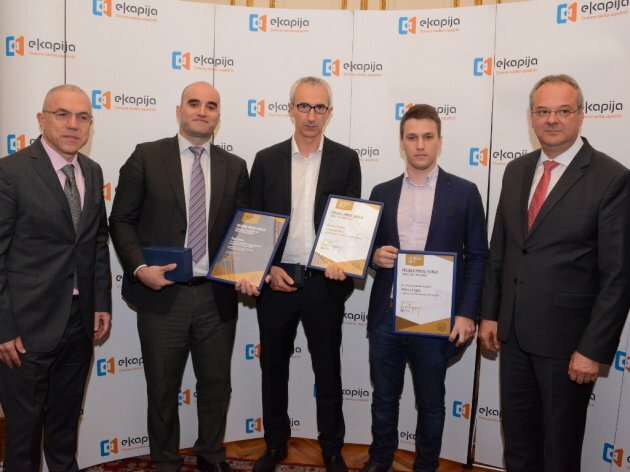 The company Logit Solutions is the winner of the Aurea 2017 investment of the year award, handed out by the eKapija portal for the ninth year in a row, and the winner was presented with the award at the ceremony held in Aeroklub Belgrade by the acting director of the Development Agency of Serbia, Zeljko Sertic. Logit Solutions has developed a unique technological platform called AgriSens, performing agricultural area survey processing and data analysis, based on a variety of information techniques. The surveying of agricultural areas is performed by drones or other aircraft, and the images are then processed by the software, providing farmers with concrete, concise and usable important information. This way, AgriSens enables agriculturists to review the quality of the sowing and the plantations, the expected yields, areas under risk of plant stress etc, with minimal expenses and without requiring the skills of handling modern technology. – This award is an important acknowledgment for our company, further confirming our belief that we are on the right track in our business endeavors and development of software and technological products. Commercial use of unmanned aerial vehicles, as a new industry, carries with it numerous uncertainties related to the dynamics of market development and investment feasibility. Even though 1,000 users in more than 40 countries all over the world testify to the success of the idea and the investment, the technology is only in its early stages and is an innovation on a global level. We firmly believe that the joining between IT, agriculture and commercial drone use guarantees further success of our product and services, and the Aurea award is the latest in the line of proofs confirming it – said Milan Dobrota, CEO of Logit Solutions. Milica Milosavljevic, editor in chief of eKapija, pointed out that an increased presence of startups among the companies nominated in 2017 was quite noticeable and an indication of better days for entrepreneurship in Serbia. – The shortlist once again included eight projects of remarkable quality, whose time is yet to come. This year's winner, the AgriSens platform, is a true example of an ever increasing interest in the modernization of agricultural production through the implementation of IT solutions, which will become a necessity in the future. They are also the living proof of the fact that a small local company can stand shoulder to shoulder with the global competition – Logit Solutions is one of only 5 companies in the world developing this kind of software. I want to congratulate the award winners and all the nominees, which have shown that our country isn't lacking in innovation and good ideas. In addition to the main award, eKapija also handed out two special acknowledgments: the innovation prize belonged to Eton Digital, for its organic food social market OrganicNet, whereas the winner of the social usefulness award is Weiss Light, for its LED lamp factory in Ugrinovci. Aside from the awarded investments, another five projects places in this year's Aurea innovation of the year award finals: PetroSOLAR – intelligent, solar-powered street furniture, VisMedic – telemedicine web platform, Elektrovat – best practice implementation in the construction of SHPP Beli Kamen, Hydrogen Technologies – hydrogen-based ICE decarbonizing machine and OnoBikes – Archont electric bicycle. The winners of the main Aurea 2017 award and the special acknowledgments were picked by a jury of seven, and readers of ekapija.com and aurea.rs were also able to vote. The requirement for taking part in the contest was for the projects to have been realized in 2016, while meeting the three criteria: innovation, social usefulness and financial potential. The strategic partner of eKapija in the Aurea 2017 awards project is the consulting and auditing firm KPMG, whereas Global IT Factory was the partner of the project. 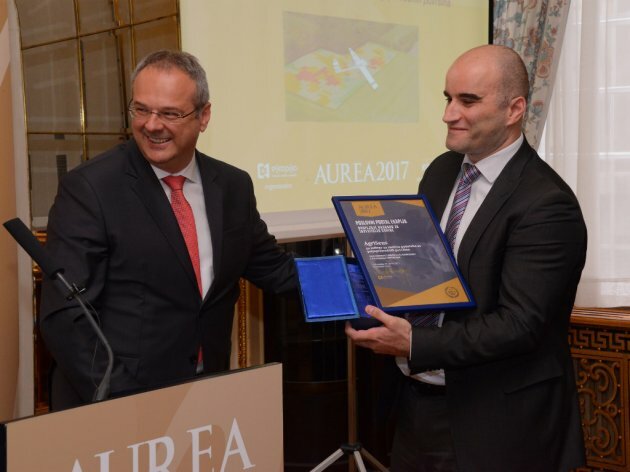 The Aurea 2017 award ceremony at Aeroklub Belgrade was attended by numerous representatives of the diplomatic corps, the business community and the media. Belgrade-based company Logit Solutions has developed a unique technological platform called AgriSens, performing agricultural area survey processing and data analysis, based on a variety of information techniques (Machine Learning, Data Science and Computer Vision). The surveying of agricultural areas is performed by drones or other aircraft (airplanes, satellites), and the images are then processed by the software, providing farmers with concrete, concise and usable important information. The user gets the analysis of the surveyed area in the form of a PDF report, providing three basic types of information: plant counting, plant estimating and stress monitoring. This way, AgriSens enables agriculturists to review the quality of the sowing and the plantations, the expected yields, areas under risk of plant stress etc, with minimal expenses and without requiring the skills of handling modern technology. Logit Solutions is only one of the 5 companies in the world developing this type of software. The AgriSens platform has been developed for the past two years, and the commercialization of the software started in the spring of 2016. In under a year, 1,000 users in over 40 countries throughout the world, most of them from the US, central America and the western European states, have started using AgriSens. The technology has been fully developed by the engineers of the Belgrade company (local know-how) in cooperation with experts from the University of Belgrade and associates from the fields of agronomy, statistics and electrical engineering. The company has thereby contributed to raising awareness of the importance of implementing IT solutions in agriculture. Globally, finding solutions for enhancing agricultural production by using modern technology is practically becoming an imperative, since the world population is facing the growing challenge of producing increasingly bigger amounts of food with increasingly fewer available resources. The idea of developing AgriSens itself initially emerged as a result of following global scientific and technological trends, and the field is known as Precision Agriculture. For more information, visit aurea.rs.